Bernie Madoff understood the concept of the float. He had fun with it for 30 years. A bank at any one time doesn’t have the cash to pay off all deposits and there is little worry that it will have to unless there is a run on the bank. What brought Bernie down was the fact the money coming in was less than the money going out. The FDIC insurance fund was established in 1934 to give the people confidence in the banks when there was none. If your bank had a good balance sheet that was up to par with Fed standards they were given the opportunity to become FDIC insured. Nine banks went under that first year, but that wasn’t close to the 4,000 that closed in 1933. The FDIC was pretty much collecting insurance premiums from the banks and paying out very little in claims. Fannie Mae was created in 1938 to help stimulate the “depressed” housing market. Banks were not interested in investing in home loans. So this government program supplied the banks with federal money to finance home mortgages. Notice here too, the damage to the housing market had already occurred. Fannie wasn’t really sticking its neck out to insure the market. Then we have the IRA retirement plans that started in 1974. These plans allow a wage earner to shelter income from taxes. Once you put it in the plan, it is no longer yours, the government tells you when you can spend it. Pay in hard earned dollars today and get back watered down whiskey when you retire. If we examine the savings of our nation, It is somewhere around 20 trillion dollars. Probably between 8 to 14 trillion of that has vaporized. So going back to the Ponzi scheme, two things have happened that were not anticipated. The FDIC is insuring the bad decisions of bank managment, bank credit became very easy to come by. Also our government is insuring investors against loss for home loans that were written to just about anyone. It could be argued that the government programs encouraged this mess. Madoff's Ponzi scheme collapsed when funds withdrawn exceeded those being deposited, and it ruined a great many people. Now we have a Ponzi scheme that depends on the Federal Reserve printing currency to cover the bad home loans and cover the failed banks. 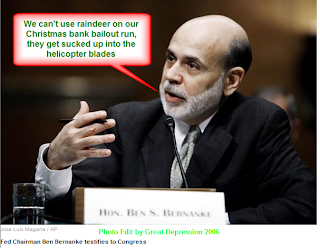 There is no concept that the Federal Reserve can run out of money or go to jail. Now if we take this one step further, there was no excess money for Congress to spend during the prosperous years. But they found ways to increase spending. Now we have a financial crisis and funds are being found in abundance. We know that Congress never saved for that rainy day. Just look at the national debt at 12 trillion dollars. Do you get the feeling that somewhere along the line people are going to want real money, not this stuff that Bernanke is printing? Presently if the dollar were to be revalued, 1:10 –--which seems pretty plausible, the government would be confiscating 90 percent of the savings of the people that have money, and issue a new dollar. Of course if you had no savings, you lost nothing. This could be the final game plan. What you need to examine, is what would make banks lend again? There is no real profit incentive if the currency gets revalued every 10 years. There has to be a link to gold for real stability, but in lieu of that, you get very high interest rates to compensate for the risk. The real question to ask is how much of our retirement funds are really there? Since there is no real urge to spend it all today, the concept that half of our savings is gone is not apparent. The government can't print gold and silver. I've given my retirement plan the boot. I'm going with silver from here on out, gold is too expensive. I might pay more in taxes, but you have to ask one question: "If toilet paper goes to $200 per roll, did you really enjoy a tax savings by shoving it into an IRA or 401K? Here is a bit of pure speculation on my part. When Congress came to the aid of the banks with the TARP money, things were not quite as they appeared. At that time, bank accounts were Federally insured for 100K. A person with 20 million dollars in cash, would need 200 banks to deposit the cash for the FDIC insurance coverage. Most likely the 20 million was in one bank. What we could have been looking at here was the flight of big money out of the banks, not the small deposits. Back in the 1980’s we had a bank called Continental Illinois that the FDIC deemed too big to fail. Here is an interesting link to that fiasco: Continental Illinois and “Too Big to Fail.” The Fed ended up covering all deposits to stem the run on the bank. Of course they ended up owning it in the end. The FDIC has no problem coming to the aid of the banks. AIG (a non bank) was another story, a black hole for over 200 billion in TARP money. Now the banks have stabilized and the word is out, all of the banks "Too Big to Fail" are FDIC insured for ANY amount, no matter how large. The big money is returning back to the banks. The banks no longer need the TARP money and can return it to the Fed. This eliminates the TARP restrictions on large bank employee bonuses. The whole thing smacks of a Fly-By-Night-Airline. Imagine your airplane flight landing at an airport midway to the destination and then the pilot passes the hat among the passengers for gas money? Here's a bank selling stock, to pay off a TARP loan! Is it because they’re broke???? "Too big to fail," is the Modus operandi for the Fed and the players know the rules to that game. The bankers get their bonuses and they did it right under our noses; irritating to say the least. The following email was sent to all of the Poway Unified School District Supervisors by Dr. Don Phillips Superintendent of Poway Unified Schools, November 16, 2009. It left me with a very heavy heart. This gentleman is fully focused on his job and what has to follow to accomplish his goals. It is a preview of what the schools in California have to deal with. These problems are not invisible and they are not going away. It is hard to address problems that the general public doesn't fully comprehend. Read and enjoy, it is well written. As you know very well already, the Poway Unified School District has faced two years of extreme fiscal challenge. The nationwide recession has affected California more than most states and has led to dramatic cuts statewide to K-12 education funding. For the 2008-09 and the current 2009-10 school years, Poway Unified has been faced with budget shortfalls totaling approximately $48 million. To keep our district fiscally solvent, we have made spending reductions totaling over $22 million, meaning real cuts to personnel and programs. In addition to these spending reductions, we have applied one-time federal stimulus funds to balance the general fund, implemented state-approved flexibility transfers of categorical funding, and utilized voluntary salary rollbacks of 2.7% from most district staff members to address the remaining $26 million budget shortfall These strategies have allowed us to minimize class size increases through the retention of teaching positions, maintain programs for students, and retain many support staff positions. Through it all, we have worked together to provide our students with the very best education possible with fewer resources. Few, if any, districts have had the can-do attitude to make this happen, and I feel honored to serve as superintendent in this amazing organization. Unfortunately, our financial woes have not gone away, and economic experts are telling us that, while it took two years to reach this point in the recession, it will likely take five years for the economy to fully recover and for state funding to education to return to 2007 levels. Though some economists are declaring the recession has bottomed out, California’s very high jobless rate, the absence of major capital gains taxes on income, and the predictable lag in tax revenue that always follows an economic downturn all suggest a slow rebound for state tax revenue and therefore funding for K-12 public education. The dismal state economic picture will sadly have an additional impact on the District’s budget for the 2010-11 school year. Our challenge is further compounded by the fact that most of the federal stimulus dollars, as mandated by law, must be spent by 2010. In effect, we are currently spending significantly more than our ongoing revenue would allow, given the use of one-time funding from various sources. We currently estimate that PUSD will face a budget shortfall of approximately $17 million for the 2010-11 school year. This assumes that we face no additional budget cuts from the state, which is unlikely given that state tax revenues are already falling $5 to $7 billion behind the updated projections for the current fiscal year. The only helpful relief on the horizon is the possibility of a second wave of federal stimulus dollars that could be as much as $2 million, but this is just a possibility at this point. These state budget cuts and potential loss of one-time federal funds place us in a most challenging position. Our programs for students, and staffing levels that have survived the last two years of cuts, are the highest priorities in our budget. Reducing any of these high priority programs will be most difficult. However, the size of these state cuts requires us to consider options we would never have considered before. We will need to make reductions at every level in the organization, and we will need to explore combinations of very difficult cuts to reach the needed $17 million in reductions. Finally, as a school community we are going to have to make choices none of us like or feel are best for students. However, I am confident we will get through this period and continue to meet the educational needs of our students in the best way possible. While it is still early in the 2010-11 budget-building process, the financial picture does appear bleak. I provide this information not to alarm unnecessarily, but to share with you the size of the challenges facing our district and allow time to discuss and think about how we can best meet these challenges as an educational institution. Can You Afford a Dentist? I had a dentist appointment yesterday to get a tooth filled. This is a medical group office with three dentists and a dozen support assistants. So when I pulled in at 7:50 for my 8 am appointment the parking lot was pretty empty. I was figuring that I must have gotten the time wrong. But sure enough they were open. My simple filling turned out to be a ceramic inlay with 2 surfaces. My share was $395 with insurance. They are up front with the costs, you pay first and then they do the work. I balked at the price (choked is a better description). I pointed out that I had already spent $1200 on one root canal and two crowns so far this year. The secretary doing the financing dropped the price down to $250 and let me use a $100 dollar off coupon they had sent me. Between me and my insurance, they got about $450 (the insurance paid $300). So they "owned" me for two hours. During that time only one other patient came in to my area (there are 4 stations), and that was for an estimate. It was just me, the Doc and three hygienists. After they finished, I got up and went into the outer office and noticed that there were only two people waiting in the lounge. It saddened me, the lounge use to be full of people. I should have guessed what was happening when I called for an appointment and they wanted to schedule it the next day (I need at least a week to mentally prepare for dental work). People are cutting back. It is all very invisible; you won’t read about it in the morning paper, but you will read it here. Save a dentist and "stimulate" the economy, go get that tooth filled.